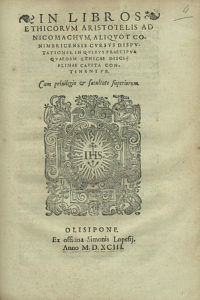 Composed by the Portuguese Jesuit Father Manuel de Góis (1543-1597), In libros Ethicorum Aristotelis ad Nicomachum, aliquot Conimbricensis Cursus Disputationes in quibus praecipua quaedam Ethicae disciplinae capita continentur is the only volume pertaining to the Coimbra Jesuit Aristotelian Course that does not exhibit in its title the word “Commentary”. Nevertheless, Bartolomeu Ferreira (Professor of Holy Scripture and Books Censor), acting on behalf of the General Inquisitor, the Cardinal Prince Albert, explicitly identifies the volume as “quaestiones cursus Conimbricensis in Ethica Aristotelis”. Ferreira’s approval dates from June, the 22nd, in the year in which the volume was published, 1593. However, by 20th May the Archbishop of Lisbon, Miguel de Castro, gave his “imprimatur”; one month later, June 23rd, the volume was at the Inquisition Council, for the approval by Bishop Jacob de Sousa, and after two days, the volume was to receive the license of the Senate, signed by Jerónimo Pereira and Melchior de Amaral. Much smaller than the volume On the Heavens, on Ethics was nevertheless examined by five scholars and censors; Bartolomeu Ferreira, Jacob de Sousa, Miguel de Castro and Marcos Teixeira share the common task of examining both On the Heavens and Ethics. The Aristotelian Jesuit Disputations on Ethics was the last volume published by Simão Lopes Printing House, in Lisbon and it is thus possible to follow the pace of the publisher: after receiving the manuscripts in September 1592, from the beginning of 1593 until the month of May of the same year, Lopes published the volumes On the Heavens, on Meteorology and on Parva Naturalia; from June 1593 until the end of the year, surely, the volume on the Ethics. If one wishes to have in mind Manuel de Góis work, at this stage, one must remember that, as was mentioned in the equivalent introduction to the Parva Naturalia, his work On Generation and Corruption was probably finished in 1592. With the exception of On the Heavens, as happens with all the volumes published in Lisbon, this editio princeps does not publish the Aristotelian text, not even in its Latin translation. Instead, as its model are some parts of Thomas Aquinas’ Summa Theologiae. Moreover, and as has been said, the volume on Ethics also represents another exception given that it does not follow the explanation method, but each one of its nine disputations is divided into questions and these again subdivided into articles. The book ends with an Index of all its disputations and questions, and another one about its content matters. In its whole, the editio princeps of the In libros Ethicorum Aristotelis ad Nicomachum, aliquot Conimbricensis Cursus Disputationes in quibus praecipua quaedam Ethicae disciplinae capita continentur was published with 95 pages (230x170mm) thus being the smallest of the eight volumes that belong to the Coimbra Jesuit Aristotelian Course. With the exception of the volume of the Dialectics, this title reproduces in its cover the logo of the Society of Jesus, with the Latin motto, “Nomen Domini Turris Fortissima”.